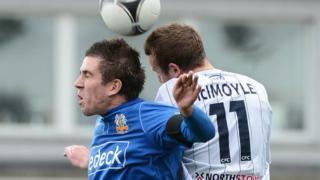 Glenavon's Andy McGrory grabs an injury time equaliser to secure a 1-1 draw against Coleraine at Mourneview Park. McGrory prodded home from a corner to secure a point for the hosts in a game which Coleraine dominated. Stephen Lowry's excellent goal four minutes from time gave the Bannsiders a deserved lead.